3. Close the lid and cook the mielie for about 20 minutes, rotating the ears every 3-5 minutes, to insure even cooking on all sides. 4. Remove mielie from the grill and allow to cool for about 10 minutes then remove the husks. 5. 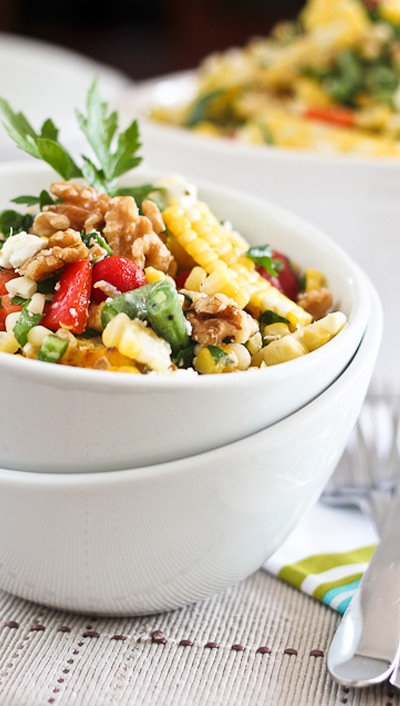 Remove kernels from the cobs and place in the fridge to cool completely, preferably overnight. 6. Of course, you can also use leftover mielie or even frozen mielies. 7. When mielie is good and cold, add it to a mixing bowl along with the rest of the ingredients. Blend to combine. 8. Serve immediately or leave in the fridge for a couple of hours to allow for flavors to combine.